We make a difference in how customers take new products to market. Sanmina realizes the critical importance that New Product Introduction (NPI) plays in optimizing a new product’s time to market. When we help customers launch complex products, we can provide substantial engineering, technology and manufacturing expertise to achieve that customer’s vision and minimize the cycles of design iterations prior to launch. At Sanmina, we have a proven track record of successfully launching new products for our customers with the full support suite of design, quick-turn prototyping, product verification, volume production and logistics. 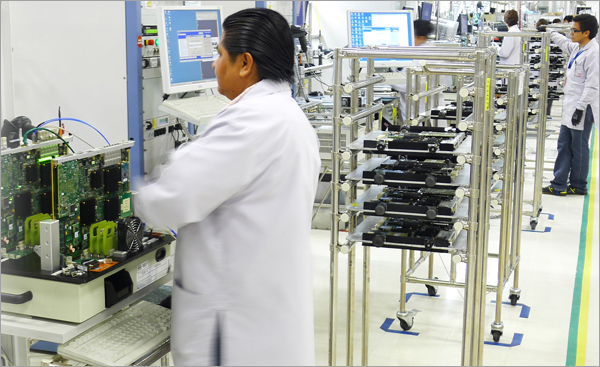 To ensure a smooth product launch, we deliver not only our customers’ products on time but also provide them with post-NPI build services, plus feedback on what can be done to improve product quality and manufacturability. We also provide guidance on component selection, printed circuit board (PCB) layout, chassis design, cable design and test planning, and innovative technical solutions for micro-packaging and complex functional test. In addition, we assign a cross-functional project team with expertise in engineering, test and supply chain, providing customers with the resources necessary to get a product to market on time and on budget. Our approach to NPI focuses on “time to opportunity” — that is, a relentless focus on predictability, high quality and flexibility. We call this “NPI Express.” It’s a term that defines our approach to delivering on a deadline for customers who are looking for quick-turn prototypes. Standard turnaround times are between 72 and 120 hours with some products turned in as few as six hours. Partnering with Sanmina also allows customers to leverage the end-to-end offerings and scale of a global Tier-1 integrated manufacturing solutions (IMS) company with the individual dedication and attention to detail of a local engineering and manufacturing staff that focus on a customer’s design, component and quick-turn manufacturing needs.